Getting the family together, turning off the television and having some nibbles...all while playing a board game, was one of my favourite ways to spend an evening as a child. We used to play board games quite a lot as a family, especially on holiday when life didn't get in the way. 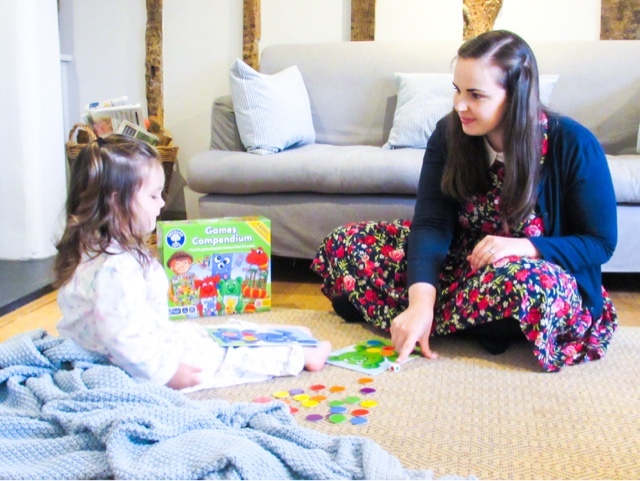 It was something I looked forward to doing with my own children, so when I fell pregnant with Isabella I dreamt about all snuggling up and playing games together in the evening. Fast forward nine months and I quickly realised it was going to be a long while until board games were going to be part of our day (kind of obviously, but my excited mind had run away with me). Isabella is finally at an age where she can not only understand how to play simple games, but also absolutely loves them! 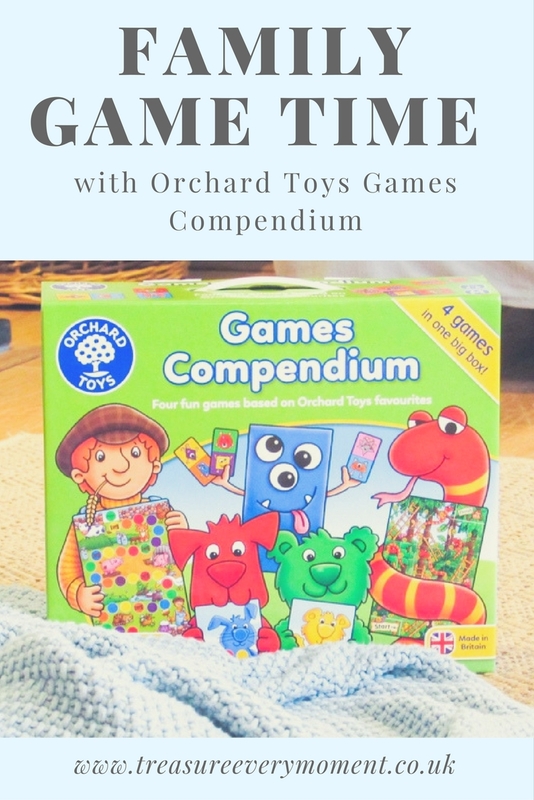 Orchard Toys have recently released the Games Compendium* (£15.95), which contains four games in one box aimed at 3-6 year olds. The four games include: Old MacDonald Game, Monster Dominoes, Red Dog Colour Game and Jungle Snakes & Ladders, all of which require between 2 and 4 players making them ideal for some quality family time. The Red Dog Colour Game is Isabella's favourite - you roll a dice with coloured spots on and pick up a counter on the corresponding colour. Place that on your board and it is the first person to collect all the colours on their board that wins. 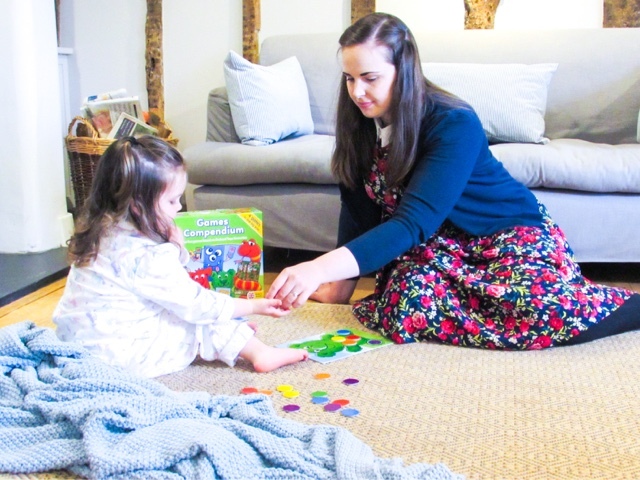 This is a really good 'first' game because it is simple to understand, doesn't require any counting and helps children to learn their colours. The Monster Dominos are also a popular choice in our house and I really like that the learning opportunities are extensive with this game. You can discuss matching the colours, shapes, monsters and learn the concept of dominos. The Old Macdonald Game is a fun one for any children that love animals because on the back of the coloured counters used for the Red Dog Game are an array of animals. The final game in the box is Jungle Snakes and Ladders, which is not only a classic childhood game but also one that is ideal for slighter older children. Isabella is a little bit too young for this game at the moment because she hasn't learnt the concept of counting consistently yet. 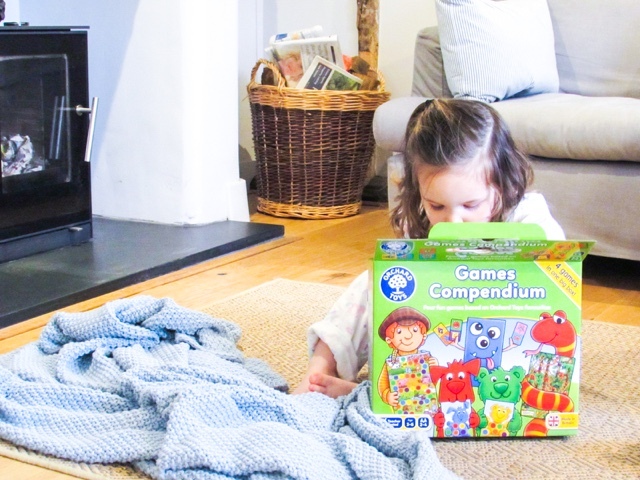 That's a really good aspect of this Games Compendium, it has games suitable for a range of ages and will therefore grow with your child. As will all Orchard Toys products children's development is the focus, all while having fun and creating happy memories. While playing the four games in the Games Compendium children will be developing their matching, colour and counting skills. 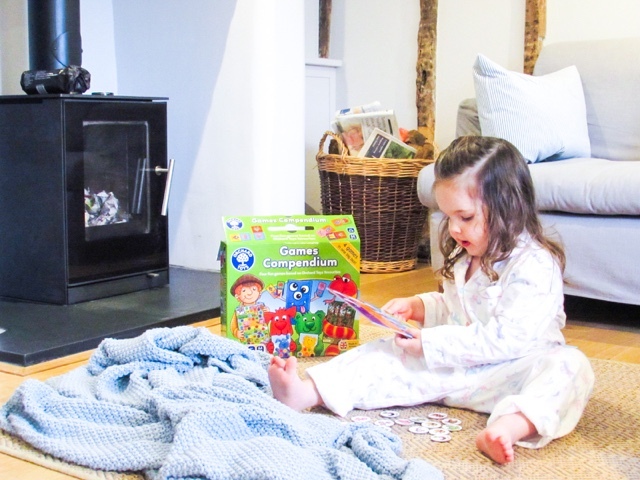 Children want to be entertained and are learning all the time, so having four games in one box is the perfect way to spend some quality time together. What was your favourite board game as a child? We love family game time. Admittedly though, we haven't had much time to do it lately. Those games look so much fun. Looks like a great family game. Good idea for my niece's Christmas present. 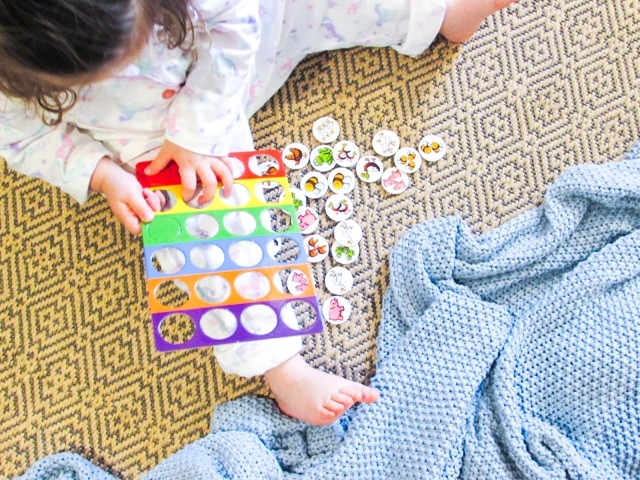 I love board games for the colder season and I can see the kids loving this one! They look great. We're eagerly awaiting our son to get a bit older to enjoy board games with him as we love them. My favourites were Monopoly and Operation. I love that it is four games in one box - space saving and extra fun! I got some board games for the kids. Going to be playing with that a lot this half term. We absolutely love the orchard games , they have kept the girls amused for hours . Good post. I learn something tougher on different blogs everyday. It'll at all times be stimulating to learn content from other writers and observe somewhat one thing from their store. I’d choose to use some with the content on my blog whether or not you don’t mind. Natually I’ll offer you a link in your internet blog. Thanks for sharing. There are times when the great exceeds the https://www.brainteasingriddles.com awful. In the event that this occurs and there are no issues with the amusement itself; the terrible side is only that one minimal fly in your room which is no major ordeal. Worker placement free vbucks have been very popular the past decade with games like Agricola, Caylus and Stone Age setting the standards high. With "Lords of Waterdeep", Wizards of the Coast attempts to enter the area of Eurogames and stir the waters, by delivering a high quality game, set in the "Dungeons & Dragons" universe. Let's see how successful this attempt is.